Review: "Tempest: ShapeShifter" - Sea of Tranquility - The Web Destination for Progressive Music! On Tempest's tenth album, Shapeshifter, the ethnically diverse folk-rock band does, indeed, shift shapes. This is arguably the group's most accessible collection of songs � a 10-track 50/50 split of charming original compositions and reworked traditional pieces that swell with Celtic warmth and character. The harmony vocals, courtesy of newcomer Sue Draheim (who also plays fiddle and viola) are more prominent than ever, and Norwegian singer Lief Sorbye expresses himself with a confidence that's both authoritative and intimate. Rounding out Tempest's 2003 lineup is Cuban drummer and Sorbye's fellow founding member Adolfo Lazo, plus American bassist Mark Skowronek and Irish guitarist Ronan Carroll. While Jethro Tull comparisons are still valid mainly because of Sorbye's singing style, Tempest's sound remains distinct because of the band's tendency to rekindle with contemporary drama and flair traditional 19th century songs you've probably never heard, such as the 10-minute murder ballad "The Cruel Brother" and the English coal mining rocker "Byker Hill." Likewise, Tempest's original songs are just as captivating. "Carnival" is an acoustic mythological love song Sorbye wrote with his wife about a man who falls in love with a carnival woman known as a "shapeshifter" � from which the album derives its title. The mandolin-propelled "Winter Night" is lush with aural imagery, while "Natural Law" could be the only pop song the band has ever recorded. 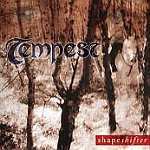 While previous Tempest albums tend to grow stale by record's end, Shapeshifter holds the listener's attention for the complete 47 minutes. If you're new to the band, this is a perfect introduction. And if you've been a fan for any or all of Tempest's 15 years, your faithfulness has now been justly rewarded.